We reached our second school in Terengganu at around 8.50am and started setting up Scratch on the computers while the student were having their recess. We started the workshop right after their break at 9.30am. The students were quick to finish the task given. Since we ended ahead of schedule, we introduced Blockly Games (try it yourself too!) to the students as extra sources for them to discover and explore. Before ending the workshop, we showed and explained the functions of the 3D printer as well. 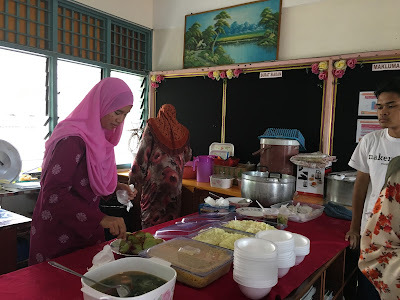 Later, we were invited by the teacher to a Raya 'Open House' organised by one of the classes. We even tasted noodles which was prepared by the school headmaster herself! It a special experience for us mentors - seeing the teachers and students together like a big family in a heartwarming environment.